Boom! 1301 Walnut is no more. The old historic building is gone and construction is now underway for a new four-story office building in downtown Boulder. The future 63,000-square-foot commercial building will feature class A office space (upper levels), flexible space at the street level, and yet more offices below grade. It will also be LEED Gold certified. Here's what the future building will look like. Meh. The Planning Board somehow gave this project unanimous approval, but it looks soulless to me. 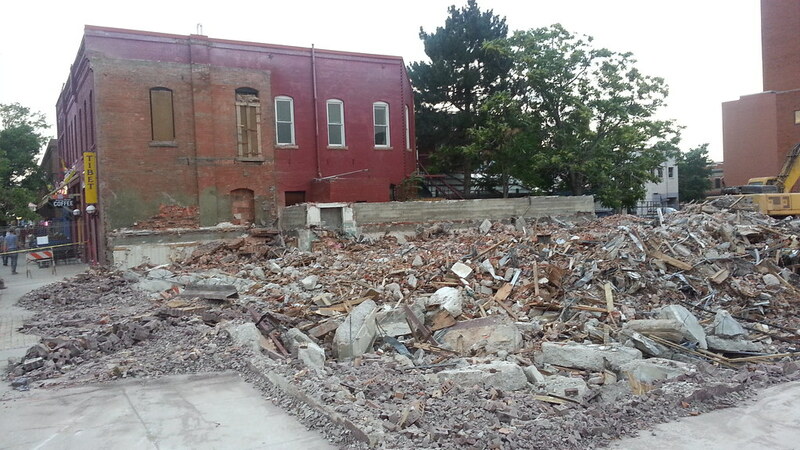 We need more high quality office space in downtown Boulder, but I'll miss the character of the old building. Now here's the rub. From what I've read, only ten parking spaces are being provided on the east side of the first floor (against the Colorado Building). Access to this one-way parking lot will be from Walnut on the east side of the site, and cars will exit into the alley and then head west to 13th Street. So... expect to see more of this and probably more of this, too. That's my truck getting ticketed, by the way.